Through the eyes of the men involved, Meredith Hooper recounts one of the greatest tales of adventure and endurance, which has often been overshadowed by the tragedy that befell Scott. Their tents were torn, their food was nearly finished, and the ship had failed to pick them up as planned. Gale-force winds blew, bitter with the cold of approaching winter. Stranded and desperate, Lieutenant Victor Campbell and his five companions faced disaster. They burrowed inside a snowdrift, digging an ice-cave with no room to stand upright, but space for six sleeping bags on the floor--the three officers on one side, the tree seamen on the other. Circumstances forced them closer together, their roles blurred, and a shared sense of reality emerged. This mutual suffering made them indivisible and somehow they made it through the longest winter. 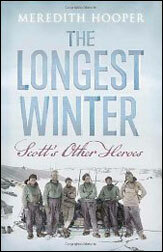 To the south, the men waiting at headquarters knew that Scott and his Polar party must be dead and hoped that another six lives would not be added to the death toll. Working from diaries, journals, and letters written by expedition members, Meredith Hooper tells the intensely human story of Scott's other expedition.